England World Cup winner Lawrence Dallaglio says he believes rugby league convert Sam Burgess could force his way into Stuart Lancaster's squad and has also been impressed by his aura. Burgess, 26, switched to rugby union last season and is part of England's World Cup training squad. "He might force his way into contention which again is quite exciting," Dallaglio told BBC Points West. "I've been following his progress, he has presence, an aura about him." 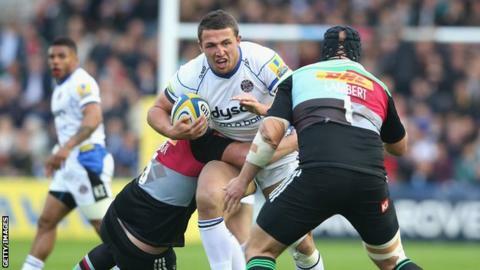 Burgess began his Bath career at centre but has now switched to the back-row and Dallaglio says the cross-code star has the potential to make an impact in the 15-man game. "To play for your country you need to have involvement in the game and since he has moved from centre to the back row we've seen him have much more," he said. "I like the guy. I'm quite surprised no-one has tried to properly lay one on him yet. He's an outstanding prospect and I'm sure he's causing the coaches a headache or two." However, he does fear their inexperience at international level could prove decisive. "It's a pretty tough tournament but as the host nation, England should go in there feeling very proud and with a great opportunity," he said. "I think we are genuine contenders by nature of us playing at home. We are probably the most inexperienced team of all the genuine contenders and I think that may count against us. "What this rugby World Cup tells you is hardened, seasoned veterans tend to do quite well as you need to understand how to deal with pressure. "But they have home advantage and talented players and I'm expecting big things of England. "If they can come out of their group as winners they really do have a big chance and then we can dare to dream." Read more on Raheem Sterling: How does his progress compare to Messi, Ronaldo, Rooney? Who will win a wide-open Open? Read more on Open 2015: Who will win at St Andrews' Old Course?